Tag Archives for " Hannah Adcock "
Search engine optimization (SEO) is changing fast. It used to be that you could use keyword stuffing and other such techniques to boost your rankings. No longer. Google and other search engines are committed to rewarding quality content that clearly and precisely answers a browser’s question. So our SaaS company SendOwl decided to focus our SEO efforts on creating quality SEO-focused content. And it worked! Six months on our signups from SEO are at 40%. There are lots of different ways you can grow your business and it’s important to find out what works for you. Although we suspected SEO might work well for us, we weren’t going to invest 6 months of our time in an SEO strategy unless we had proof that it would work. So, first off we ‘tested’ SEO by creating three SEO-focused blog posts and by improving internal links for other blog posts with SEO value. Immediately, we saw movement in our general rankings as well as for those two blog posts. One of those posts targeting the term jumped from ranking 25 > 6. So, we felt we had enough reason to begin a sustained effort to boost our SEO. We then chose 20 keywords that had at least 500 searches per month and were directly relevant to our business using Google Keyword Planner. Some of these were highly competitive; others less so. SendOwl makes it easy for you to sell digital products direct to your audience from your blog, social media or anywhere you can paste a link. So our keywords included such terms as digital delivery, sell downloads and PDF stamping (if you sell eBooks then PDF stamping makes the process more secure). Even with the science of data, there’s still some art involved. We knew there wasn’t any point choosing terms with 10,000 searches per month if they weren’t directly relevant to our business. Some of our search terms are actually quite low volume (around 500 searches per month) but highly targeted. After doing keyword research, we looked around for a service that would allow us to easily monitor our progress in terms of our individual rankings for keywords and our overall ranking as well. We decided Positionly (now Unamo) offered the best user experience. However, rankings can be a bit of a vanity metric by themselves, so we also collect data every month on the number of sign-ups to our free trial from SEO (by setting goals in Google Analytics ). This way we could keep track of how well our SEO activities were translating into sales. We’d also suggest running your site through Google’s PageSpeed and making any suggested changes. We discussed this as a team and came up with a ‘to-do’ list that we put on our content Trello board. First off, we went for some of the easy wins: the edits and the internal links. Then, we moved on to creating landing pages and blogs. Although our landing pages were going to be SEO optimized, they would be useless unless they converted real people. So, we made sure that each one clearly answered the needs of our target customers. Our landing page for the term ‘sell digital magazines’ shows how you can specifically sell magazines individually, as a subscription, or as a bundle using SendOwl. That’s important information for magazine publishers. We also experimented with different landing page formats, so we could see whether a specific approach converted best. At SendOwl we have an in-house development team, so we’d prototype the pages in UXPin, then share and tweak until they were finished. At this prototype stage, it’s easy to make changes. Then our development team would build them. It would be easy to write mediocre blog posts based on certain keywords to try and gain an SEO advantage. However, what’s the point? If you get people to a useless page they’ll be left with a very poor impression of your business. And Google is much smarter than you think! So even though we were writing blog posts with SEO as our main goal, we made sure they were genuinely useful as well as ‘evergreen’, which means that they will continue to be a valuable resource for some time to come. Creating quality content takes time (and money), but we already knew from our website that quality content converts. Our website has a 6-10% conversion rate, which is impressive for e-commerce. After implementing only about 50% of our to-do list, we saw our overall SEO ranking nearly double in the first few months. Sales and traffic have skyrocketed since implementing our SEO strategy. Our hike in rankings was also beginning to translate into a very nice bump in SEO sales. SEO traffic on average was spending around 8 mins looking around 7-8 pages on our website, which showed an encouraging level of engagement. 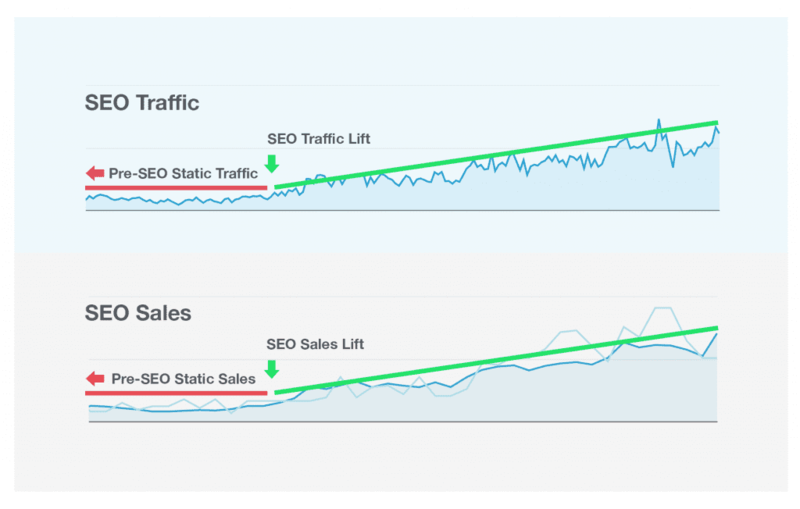 This was good news because it showed that our SEO strategy wasn’t just bringing in more traffic, but that it was bringing in the right kind of traffic. After implementing stage 1 of our SEO strategy, we were already seeing some good results. We’re already seeing a positive improvement in terms of sales. We’re already seeing 40% of our signups coming from SEO. And we hope to see even more impressive results in the next 6 months. Quality content matters for search engines and real people! Hannah Adcock is a content strategist at SendOwl. SendOwl makes it easy for you to sell digital products, memberships and subscriptions direct from your website, blog or anywhere you can paste a link.